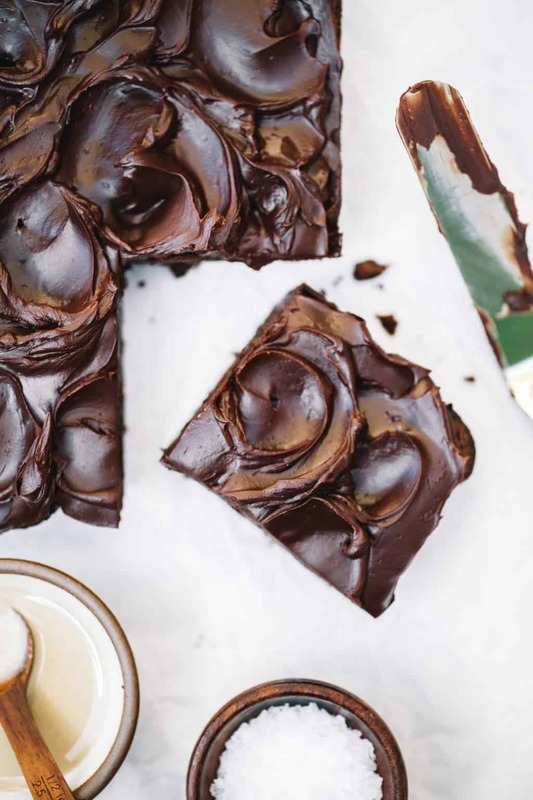 Fudgy and flavorful chocolate tahini brownies topped off with a creamy and totally fudge chocolate ganache. These brownies are a chocolate lovers dream! Are you ready to hear about the craziest thing that happened to me this weekend?! Okay, it’s really not THAT crazy but it was something that hardly ever happens to me. On Saturday I had planned to head up to Silverlake for one of my best friend’s pop up clothing shops. I was literally out the door with one foot in the car when I got a text from her saying the event was dying down and I probably didn’t need to make the drive. At this point I had my make up done, a cute outfit on and my entire afternoon blocked off. I sat in my car for a good 10 minutes debating if I should be productive or not…20 minutes later I ended up at the mall. I’m not a HUGE shopper but man those few hours were pretty sacred. I started in Sephora for a new Clarisonic brush head (that I’m obsessed with btw, cleared up every pimple I had) and walked out with $180 worth of stuff later. This isn’t total normal behavior for me so it really is okay every now and then. I spent the rest of the afternoon wandering around stores like West Elm and Anthropologie sorting through sale racks to look for new props. I came back home feeling super relaxed, so naturally, I turned the second half of season three of Queer Eye on and made these chocolate tahini brownies with chocolate ganache. I felt so rested after this day and I forced myself to promise I would do it more often. 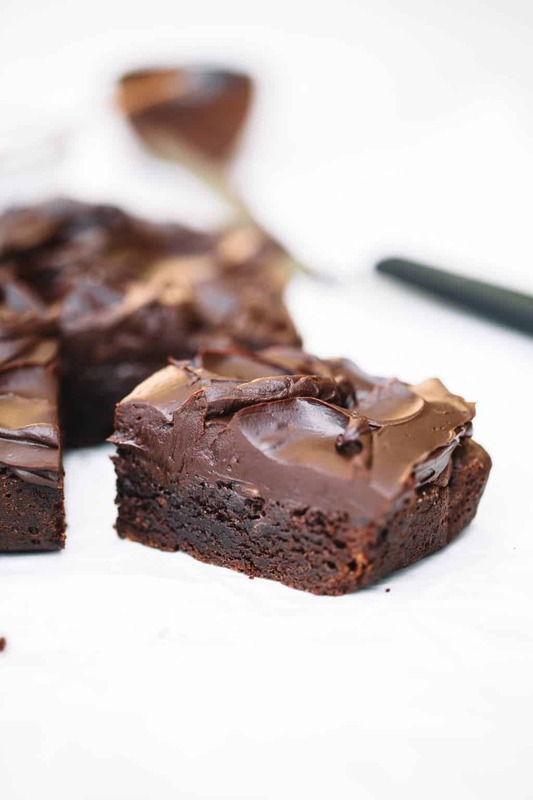 I have been wanting to make a chocolate tahini brownie for the blog for a while! I find myself incorporating tahini more and more into recipes lately and it adds such a new, nutty flavor that people don’t expect! If you aren’t familiar with tahini, it’s very similar to peanut butter but you’re swapping out peanuts for sesame seeds. The texture is a little thinner and much like peanut butter, you can use tahini in sweet or savory dishes. The tahini gave the overall brownie batter and richness and ‘moist’ profile that normal brownies just don’t seem to have. I honestly was a little worried it was going to dry the brownie out but it did just the opposite! 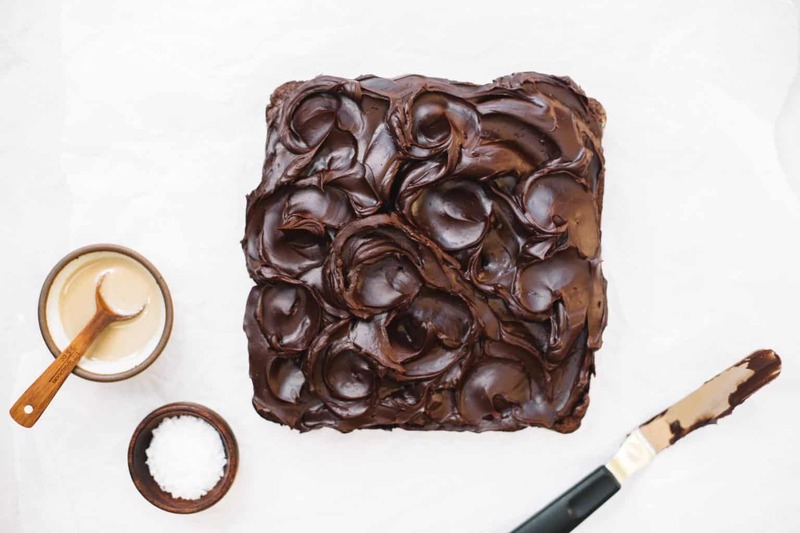 If you’re a boxed brownie kind of girl (I don’t judge) you could even add a tahini swirl on the top right before you bake them for an interesting take! The real star of the show for me was the chocolate ganache on top of these chocolate tahini brownies. I think chocolate ganache is like the guacamole of savory foods for me. I can literally eat like ANY dessert with a good slather of chocolate ganache. 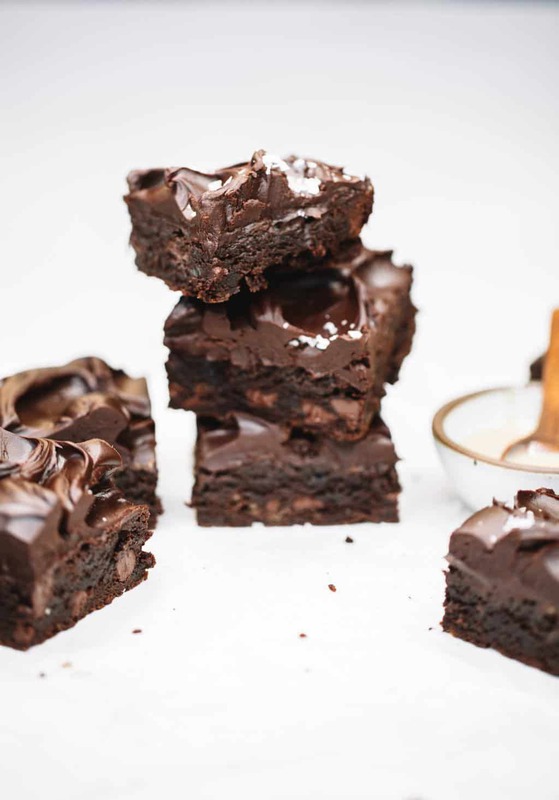 Top ganache off with a dash of flaky sea salt and you will have yourself a delectable brownie. Heat the oven to 350 degrees F. Line an 8x8-inch non stick square pan with parchment paper, let the parchment paper hang off two edges for easy brownie pull out. Melt the butter in a medium saucepan over medium heat. Remove from heat and immediately add the chocolate chips and cocoa. Whisk until smooth. In a large mixing bowl, whisk the eggs, sugar, vanilla and salt to form a slightly thick mixture. Fold in the flour, stir until just incorporated (do not over-stir). Add the melted chocolate mixture to the remaining batter mixture, stir until batter is well combined. Pour the batter into the pan you prepared. Spread evenly. With a spoon, dollop the tahini over the top. 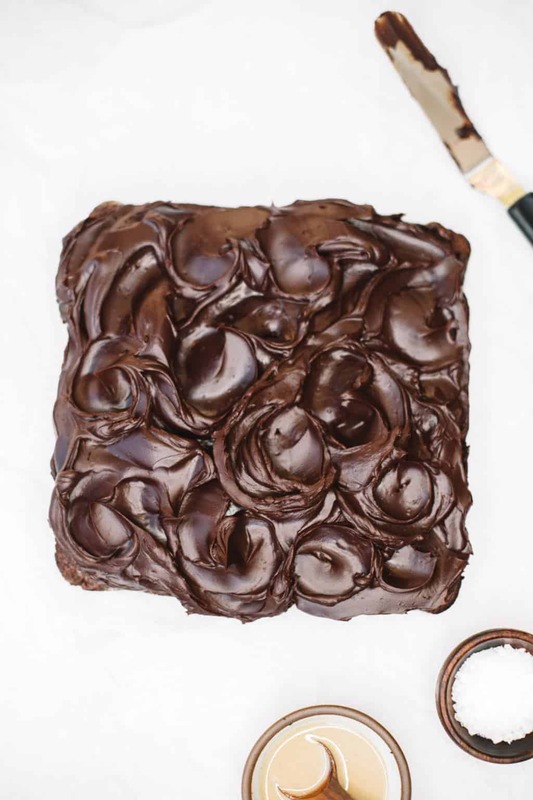 With a butter knife, swirl the tahini dollops into the brownie batter. Bake for 28-30 minutes, until the edges are set and a toothpick comes out with a few crumbs. Remove from the oven. Cool in the pan for 30 minutes. Lift the parchment sides up carefully to transfer the brownies from the pan. Cool for another 30 minutes (do not remove from the foil yet). In a large bowl add in semi sweet chocolate. In a glass measuring cup heat milk for 45-60 seconds in the microwave. Add warm milk to chocolate and let sit for 2-3 minutes. Whisk mixture together until smooth. Let ganache sit for 30-60 minutes depending on how thick of a topping you want. Spread ganache over brownies and top with flaky sea salt. Cut into 9-12 squares and serve. These brownies were soo rich and delicious. I highly reccomend the ganache on top, really brought it all together. girll that frosting looks totally epic!! Thank you so much lady! I can’t get enough ganache lately!